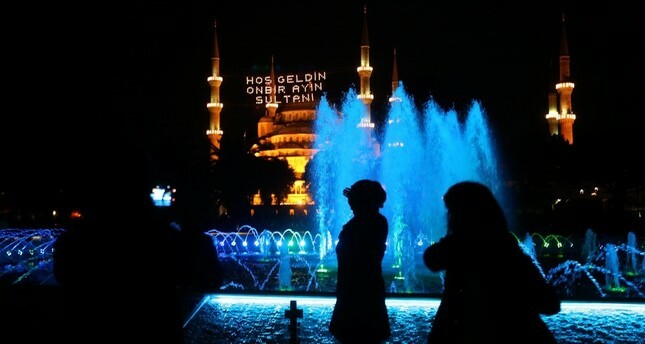 People taking pictures in front of the Blue Mosque on the first day of Ramadan in the Sultanahmet district of Istanbul, May 27. Humankind's forgetfulness is like a double-edged sword that on the one hand, allows us to continue on with our life despite the loss, grief and sorrow we experience, while on the other hand, could cost us dear unless we manage to avoid being completely immersed in it, especially given our tendency to become easily entangled in the material aspects of this world and thinking that everything is just about this world. One of the main purposes of fasting during the month of Ramadan is to help people strike a balance between these two dimensions of forgetfulness. Through the requirements of fasting such as devoting more time to good and useful deeds to win Allah's pleasure and abstaining from eating, drinking, smoking, evil thoughts, negative behavior, language and so on, people are encouraged to tackle their constant pattern of forgetfulness in respect to their relationship with their creator as well as of their expectations in their relationships with one another. So, it is a month of reflection and re-evaluation of one's life. Having said this, the emphasis on thinking and re-evaluation is not only restricted to the month of Ramadan, but is a subject frequently highlighted in the Quran and by Prophet Muhammad. Furthermore, the requirement that Muslims pray five times a day places further emphasis on the refreshing of the bond with our creator and re-evaluates the priorities in our lives that are just as temporary as those of our ancestors. A timely re-evaluation can only take place through the Quran, as the Quran was revealed to guide Muslims as to how they should live, behave and show their gratitude toward their creator. In this context, the mystery of fasting is embedded in the Quran as it constantly reminds people of the lives and the fates of their ancestors. Through a reflection of man's past and the different endings that the various nations have faced so far, the Quran lays down the bare truth that just like our ancestors, we will also pass away one day. This all is for the purposes of encouraging man to think and evaluate how he should live his life. And to guide man, the Quran lays down the characteristics of the two different paths that are available to him. So, Ramadan in a way serves as a cause for Muslims to refresh their bond with Quranic values in order for people to duly preserve their relationship with their creator as well as meeting their responsibilities in their relationships with one another. Through the hunger and thirst that is felt throughout the fasting period, people are not only reminded of those who suffer all year round from hunger, but are also reminded of the significance of all the blessings that the creator has bestowed upon us. The emphasis put on solidarity, love, care, forgiveness and support is a reminder for people to care for and share with one another. Muslims are encouraged to compete with one another in terms of these values as opposed to competing for having a nicer house, car, money or fame. Again the emphasis on forgiveness, love and care is significant. Being able to forgive despite their mistakes, loving others, caring for family members and vulnerable people in need are considered signs of piety. This is the spirit that is not expected to govern Muslims' lives only during Ramadan but throughout their lives. In fact, this spirit is not only what Ramadan is about, but what Islam is about in general. It is about contemplation, fairness, self-restraint, generosity, kindness, refusing unfairness, striving for good deeds, constant re-evaluation, solidarity, love, care, forgiveness and many other fine values that are introduced in the Quran. This is the main reason why this spirit, in other words, the Quran, appeals to all human beings as opposed to just Muslims because the values it advocates are what make up this spirit. The fact that Ramadan and the spirit and values that govern it are appreciated by everyone around the world - despite the ongoing attempts to demonize Islam - speaks for the Quran's general appeal to all of humanity as opposed to just Muslims because the values that govern Ramadan are difficult to contest and hence they are appreciated by everyone. This being the case, the constant demonization of Islam or attempts to equate Islam with hatred, terror and backwardness outlines the contrast that we are facing today because as outlined above, the Ramadan spirit is no different to the spirit that Islam encourages Muslims to adopt throughout their lives. Therefore, those who claim to be Muslims but fail to live up to this spirit throughout their lives and those who show hatred toward Islam have one thing in common, and that is ''no proper or lack of understanding of what Islam is about."